Some friends from the Edgerton WI area were up in the Hayward area this past weekend. They have a cabin up in the Cable area and like to try fishing on different lakes when they come up. Greg took them out on the flowage Saturday afternoon while I was working; I think the walleye action has been slow on the flowage lately but they caught a few small ones. The weather has been crazy up here. Lot of sudden rain storms, LOT of rain. The ground is beyond saturated and lake levels are very high. Even the little ponds are almost lake size now…..
Sunday, our friends wanted to go out on Lac Courte Oreilles for both crappie and walleye fishing. We were all at our house on the flowage talking about this, when another one of those storms hit. Heavy rain, a bit of hail and high winds pounded the house and we hoped it would quit soon so we could go fishing. The storm was fast-moving and over soon, causing us to lose power in our neighborhood. Might as well go fishing now…..
We first went to little LCO for some crappie fishing. It was slow going and difficult to find them though. None of our usual spots gave us any luck. Finally, towards dinnertime, we had a rash of bites down on the big weed line heading towards Billy Boy Flowage. Then, as suddenly as they turned on, they turned off. 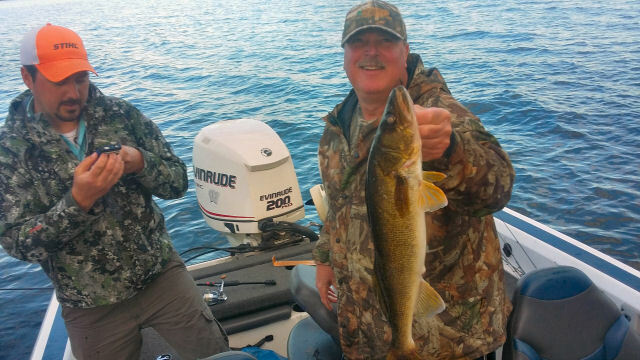 We tried a few more minutes, but then decided to head over to Musky Bay to try for walleye. By the time we got to Musky Bay, it was obvious another storm was brewing. The sky to the northwest looked dark and ominous. Sheets of rain spread across the distant horizon and we knew it would get to us soon. The water was choppy and the wind picked up speed as we all made sure our rain gear was set. This front brought with it a flurry of walleye activity though. We must have been right in a school of them and were they aggressive! 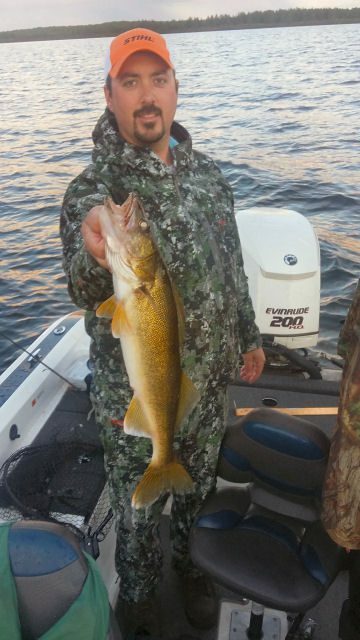 On LCO, each person can keep 3 walleyes total from 15″ and less than 20″. One of the three fish can be over 24″. None of us got one over 24″ but we sure got a bunch in the slot, which we had to throw back. 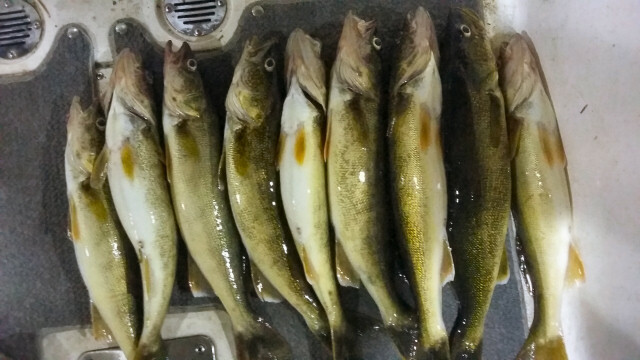 We were able to keep several smaller ones though; nice eating-size walleyes. This flurry went on for about an hour or so, and then the storm hit us. The rain came down in buckets as we kept fishing. The storm gradually passed over us and a vibrant double rainbow grew over Musky Bay – was it a beautiful! The walleye bite slowed a bit but we were still pulling them in. A brilliant red spread across the sky as the sun descended. Finally the impending darkness forced us to end our fishing trip. Starving, we boated over to Angler’s Haven for a late-night meal. The food really hit the spot; my Italian sub was hot and very tasty, Greg had an order of wings and he said they were some of the best wings he’s ever had! Bob and Ryan’s sandwiches were reportedly very good also. We finished our meal and boated over to the landing on Chicago Bay. Despite the vibrant stars, the late night sky was the darkest I’ve seen it in a while and the boat trip was very eerie! To make things worse, as we approached the dock we realized everything was pitch black-there were no lights at the landing. We had a difficult time navigating to the dock and finally found relief in the way of our truck lights. We prepped the boat and sorted through all our equipment and said our goodbyes to our friends. What an awesome fishing trip on such a magnificent lake! This entry was posted in Area Lakes, Dining & Resorts Hayward Area, Fishing, NORTHWOODS LIFE and tagged anglers haven on lco, bob and ryan kurtz fishing, cathy lareau fishing, fishing in hayward, greg kopke fishing, lac courte oreilles fishing, walleye fishing on lac courte oreilles, walleye fishing on LCO. Bookmark the permalink.